I hope you are doing well! I am finally seeing the leaves change colour here in Romania. I love this time of year when the seasons change and we can enjoy seeing God’s beauty through His creation outside. 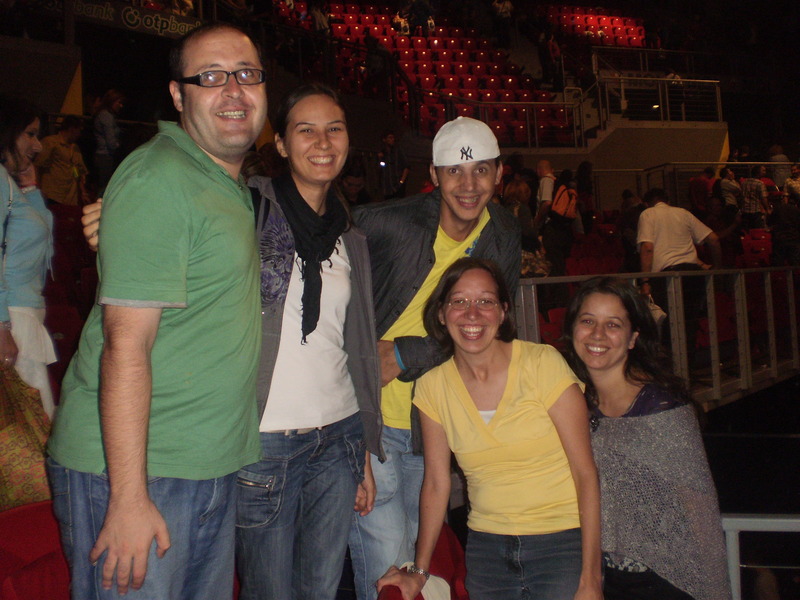 My friends and I at the concert. Slovakia, Ukraine, Romania, Serbia, Croatia and Slovenia. I heard it was the first largest Christian gathering that took place in Eastern Europe to worship and seek God together. It was very moving for to see how God brought reconciliation and forgiveness between the gypsies and the Hungarians. At one point during the event the organizer of the event invited five church leaders up to the front of the stage from different countries to pray on behalf of their country for revival. I thought that was awesome to see the unity in the prayers for the different nations. The worship time during the Jesus Culture concert was incredible. I cannot even put it into words how amazing it was to worship God along with thousands of other Christians who are hungry for God! I really felt such unity as we worshipped God and the presence of God was wonderful. Banning gave us a challenging message to embrace the mandate on our lives, to rise up to be leaders and not followers. What a blessing from God to be able to go to this event! it was another really great study! Doing this Bible study was such a blessing beyond what I could put into words and it was my first study in Romania in English too! I am so grateful that the group still invited me to be a part of it even while I was in Canada during those three months. God taught me so much about having a heart that is in total obedience and abandonment to Him; that He wants us to daily grow in His word and prayer to be able to know Him more and to learn how to fight the battles we have in our lives and just having that heart that is longing to be like Him. I am so grateful for the wonderful group of ladies that I had the privilege of doing this Bible study with and also grow together in our walk with God. “Prayer has become to me as necessary and natural as breathing”. The Vajta and Romania team! because they were quite close to Oradea so they travelled by train. They arrived here on Saturday October 15th and left on Sunday October 23rd. What an incredible week it was to serve along side of this team! I think this was the first team I served with that had a strong focus on evangelism throughout their ministry week. Almost every day they were here we went to different places in the city to do street evangelism. It was awesome to see God arrange His divine appointments throughout the week with people we met and spoke to! We also spent lots of time with the orphan and gypsy children as well throughout the week too. They did an amazing job with their 4 day VBS program at the village and also the orphan chapel too. All of the kids had a blast with them and I’m sure they loved every moment they were here. I was really encouraged by all of them. What a great week!! I praise God for the opportunity to go to the Jesus Culture concert and to do Bible studies here! I praise God for bringing to Romania the outreach team from Hungary and to serve with them! I praise God for the many friends that He has blessed with me here in Romania and at home! For the ministry that we do both with the orphan and gypsy children. Please pray that they will each discover they can have a personal relationship with God as they learn about Him every week. Pray for spiritual fruit and for hunger in their hearts to know their loving Heavenly Father. For improvement in the children’s behaviour at Sabolciu. Sometimes it is very difficult to work with the children there because they struggle with respecting us, their peers and their own parents. This is mainly because they were not taught this at a young age how to respect others. I would like to thank-you for all of your encouragement and prayers because it means so much to me!